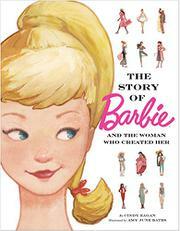 Mattel unveiled the iconic Barbie doll at the 1959 Toy Fair, but her journey there was not all smooth sailing. Ruth Handler, a white woman, came up with the idea for Barbie by watching her daughter play with paper dolls that looked more grown-up than her baby dolls. In what could be the most provocative and provoking spread, Ruth pitches Barbie to a team of evidently all-white, male designers at “Ruth and her husband’s toy company,” who say that the idea is “too different” and “impossible”; this is how readers learn that Ruth is Mattel’s co-owner. (Can they actually tell her no?) Their reactions only make Ruth more determined, and two short, explanation-free pages later, the Barbie doll is launched to great success. The commentary also evades the body-image issues that the Barbie doll has created. The book is tolerable in part due to Bates’ soft watercolor renderings depicting Barbie’s evolving career—starting with Ballerina, Nurse, Singer, and Flight Attendant and morphing into Barbies who go into space, become veterinarians, and run for president. Barbies of color—of various backgrounds and professions—pepper the inside pages and jacket of the package; however, the narrative’s relentlessly cheerleading approach and holes may leave readers ungratified. Readers after a truly inspiring story of toy invention should check out Chris Barton and Don Tate’s Whoosh! (2016).